Did you know that you should keep your rinse aid dispenser clean? I don’t know what brought you to this article, maybe your rinse aid dispenser is clogged and not working properly. Or maybe you’ve put vinegar in it and you read my article on rinse aids and learned that the acidity of the vinegar can wear down the rubber components of your dishwasher and want to get it back out. Maybe you just want to keep every aspect of your dishwasher functioning efficiently! In any case I thought it was a good idea to post a short article about how to clean your rinse aid dispenser. First, make sure the cap that secures the rinse aid dispenser is not missing or damaged. If the cap isn’t there, or isn’t able to close, the rinse aid will all come out during the prewash and wash cycles and there will be none left during the rinse cycle. Rinse aid needs to be dispensed during the rinse cycle to do its job. So if the cap is missing or damaged it will seem like your rinse aid isn’t working. 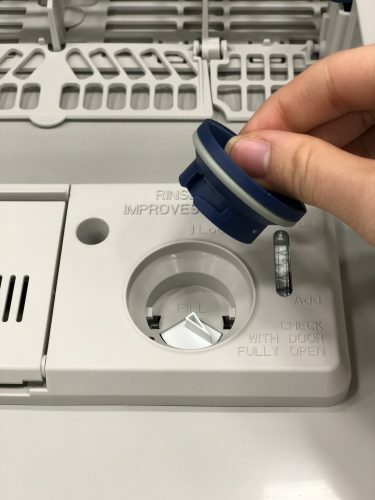 If your cap is missing or damaged you can order a new one fairly inexpensively such as this GE Rinse Aid Dispenser Cap – just make sure you find the right cap for the make and model of your dishwasher. If your rinse aid compartment is the kind that has a door that swings open and closed, make sure the door can move freely and snap all the way shut. If it is covered in heavy buildup or soap scum you should clean it with a warm wet sponge. Every part of your dishwasher should be kept clean and free of debris, soap scum, lime scale, and buildup. Using the best possible dishwashing detergent should help prevent this type of buildup! If you have accidentally put dish soap into your rinse aid dispenser skip this step! Start by unscrewing the cap from the rinse aid compartment. 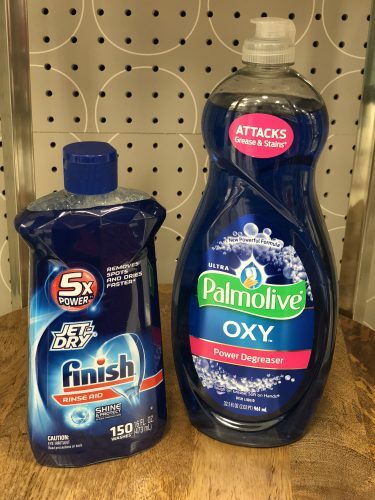 You’ll set this aside and leave it out of your dishwasher – but don’t lose it! It goes right back in when you’re done. Set the rinse aid feature to its highest setting. Sometimes this will be a small knob near where you fill the rinse aid, or under the cap. 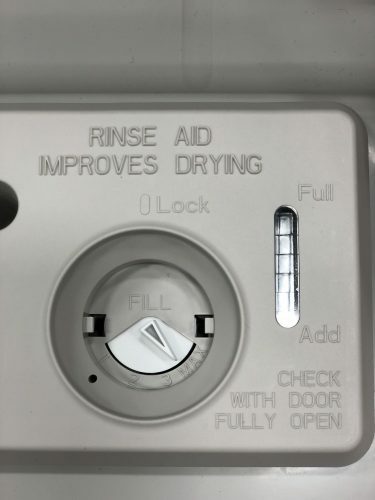 This setting opens an aperture on the rinse aid release valve wider so that more liquid can flow through it. Some automatic dishwashers do not have settings for rinse aid, so if you don’t see a way to adjust this don’t worry about it. You can also consult your dishwashing machine manual to see how to do this. It isn’t a crucial step, but it allows the maximum amount of water to flow through the compartment while the machine cycles, which can help clean it out more thoroughly. Next you’ll run the empty dishwasher with a bottle of Dishwasher Machine Cleaner. Dishwasher machine cleaner should remove any buildup, lime scale, and soap scum while killing bacteria such as e coli. Dish soap in the Rinse Aid Dispenser? You should NEVER put dish soap in the rinse aid dispenser. However, if someone in your household mistakenly put dish soap into your rinse aid dispenser (it happens more often than you might think) you should not follow the above instructions for cleaning your rinse aid dispenser, because your dishwasher will overflow with soap suds. You can get the majority of that soap out of your rinse aid dispenser with a turkey baster – just use it for suction instead of basting. I recommend flushing the dispenser as much as possible using the turkey baster with water. Then you can leave it open according to the above instructions (remove the cap and turn it to its highest setting) and run the dishwasher empty, but this time add a cup of table salt instead of the dishwashing machine cleaner. Table salt reduces the amount of suds caused by soap, so it will help prevent your kitchen from turning into a miniature bubble fun run for your children. Can the first part be done with the rinse aid compartment cap off? We actually put machine cleaner in the rinse aid compartment (accidentally) and have been using our dishwasher! I’d like to use the rest of the machine cleaner as it’s supposed to be used…Can this be done with the rinse aid compartment cap off or could it damage my Maytag dishwasher? You should run your dishwasher once with the rinse aid cap off and let the wash cycle clean the machine cleaner out of your rinse aid compartment. It happens! It’ll be okay! Woah! I’m really digging the template/theme of this blog. It’s simple, yet effective. A lot of times it’s very difficult to get that “perfect balance” between user friendliness and appearance. I must say that you’ve done a very good job with this. Additionally, the blog loads extremely quick for me on Internet explorer. Exceptional Blog! Hi, the whole thing is going sound here and ofcourse every one is sharing data, that’s genuinely excellent, keep up writing.